It has now been announced that "Charter Schools" are going to be introduced into New Zealand through a coalition agreement with the ACT party. It appears that this idea had never occurred to the National Party and is just a minor adjustment to their education plans to accommodate John Banks. The evidence is otherwise, however. National had already secretly embarked on bringing in this system (for which they have no public mandate) and I can't imagine John Banks coming up with the Charter School idea in the first place. It is no coincidence that the new CEO appointed to the Ministry of Education, Lesley Longstone, is an advocate for Free Schools (the UK equivalent of the Charter Schools in the US). Making John Banks an associate education minister to potentially roll out a contentious programme makes political sense. It will need a stubborn, thick skinned but expendable politician like John to do this (much like using Anne Tolley to bring in National Standards). Introducing Charter Schools into the New Zealand educational context will be a huge waste of time and effort and will deliver few benefits that cannot be achieved through our current state system. One of the strongest drivers for Charter Schools is the claim that their autonomy and ability to meet specific community needs will bring about improved outcomes for children. New Zealand already has many of the elements that define these schools, we have Boards of Trustees who operate with a high degree of independence and a National Curriculum that allows for the development of a local school curriculum that can be tailored to meet the specific needs of communities. The Government intends that Charter Schools will be introduced into our lower decile communities, where much of our supposed under achievement exists. This will shift the responsibility onto these communities to find their own solutions while also introducing a new private, competitive model into our largely state run system. This ignores extensive research and existing programmes, like Ka Hikitia, that provide resources and evidence to address underachievement without needing communities to reinvent the wheel. The US is ranked around 39th in the world for primary education (while New Zealand is in the top four or five) and the introduction of Charter Schools over there has seen mixed results. 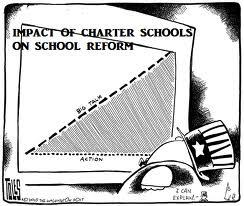 Not only will schools suffer from the introduction of the flawed and politically driven National Standards but we will have communities disrupted by the introduction of Charter Schools. Surely resourcing struggling schools properly and providing appropriate professional development to teachers will make a more immediate difference to our struggling children then introducing yet another new system that has a dubious track record. (Gordon Campbell provides his useful perspectives on this topic). School Principal Appointments Becoming Political? Labour's Leadership Change Process Flawed.